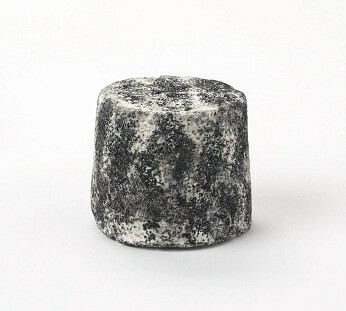 An attractive goats cheese coated with an ash and sea salt mix. Dense textured with a delicate citrus flavour. This cheese is a miniature version of the classic Cerney pyramid. The cheese takes three days to make. On the first day the starter and rennet are added. On day 2, the curds have separated from the whey and are put into moulds and on day 3, they are taken out of the moulds and sprinkled with a mixture of oak ash and salt, which give the cheese its striking black appearance. Maturation takes only a few days at the farm but several weeks at Paxton & Whitfield. Cerney has a delightful thick mousse like texture and a fresh, mild flavour when eaten at 1 or 2 weeks but will develop a deeper, fuller flavour as it matures. It shares many similarities with Valancay but tastes noticeably different, with less of a goat flavour. This is attributed to the French farmers keeping their male and female animals together, which can give the milk a distinct "billy goat" flavour, whereas in England, they are kept separately. Cerney won the coveted title Supreme Champion in 2001.